A professional roof snow removal service will help keep your residential and commercial property safe to use throughout the winter season. Accumulating snow increases the risk of ice dams, roof damage and leaks as well as injuries from ice falling on people walking by. You might consider clearing the roof yourself but this could do more harm than good as snow and ice removal is a highly specialized and dangerous job. 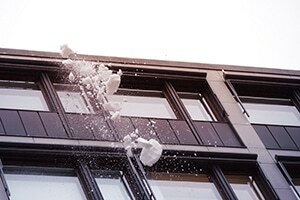 Protects your roof, property and you: Removing snow and ice from the roof is risky business. Without the right tools and experience, you could damage the roofing system or worse still, fall and injure yourself. Our professional snow and ice removal service has trained personnel and the right equipment to get the job done efficiently, correctly and safely. Reduces your liabilities: Snow and ice create slippery conditions which typically bring the risk of accidents and injuries not only to property occupants but visitors as well. An experienced snow and ice removal service will reduce the likelihood of these accidents and your liabilities. Gives you peace of mind: You will have peace of mind knowing that your roof will be cleared of snow and ice in time, thus minimizing the risk of expensive repairs and early roof replacement as well as any injuries from falling snow and ice. Preserve your roof’s lifespan: Snow and ice buildup can damage your shingles, gutters and building structure (by causing leaks in your attic, ceiling and walls). It may also block attic ventilation and result in unnecessarily high utility bills. Keeping your roof clear of snow and ice helps minimize winter damage and prolongs its use while improving your comfort and energy efficiency. Integrity Roofers is a licensed and insured roofing company that provides experienced roof snow and ice removal service across the GTA. We take great care to make sure your roof is not damaged in anyway during the clearing process. Our staff is prompt, professional and efficient, ensuring your complete satisfaction with the work we do. We provide cost-saving, long term solutions and advise you on precautions you can take to reduce ice buildup on your roof. You can also protect it from snow and water damage by having us install a waterproof underlayment beneath the shingles. To protect your roof and building structure from damage, hire our expert snow and ice removal service this winter. Call Integrity Roofers today at 416-736-7373.